Archaeologists in Egypt have uncovered a remarkable ancient tomb belonging to a high-ranking official that’s covered in colorful reliefs and well-preserved inscriptions, according to the country’s Ministry of Antiquities. Discovered last month, the tomb—located in the vast ancient burial ground of Saqqara, south of the capital Cairo—dates back to the Fifth Dynasty, which reigned for around 150 years from the early 25th century B.C. to the mid-24th century B.C., AFP reported. The official that the tomb belongs to, known as “Khuwy,” is thought to have been a nobleman during this dynasty. Fragments of his mummy were discovered alongside pieces of the canopic jars which the ancient Egyptians used to preserve the internal organs of the main body cavity for their owner’s use in the afterlife. The tomb is largely made from white limestone bricks and, notably, the inside is adorned with elaborate paintings and inscriptions made with royal colors. According to Egyptian antiquities minister Khaled al-Enani, some of these works were made using a special resin and oils that are used in the burial process. The finding could shed light on Khuwy’s significance, as well as his relationship with Djedkare Isesi—the penultimate pharaoh of the Fifth Dynasty. The tomb is located close to the pharaoh’s pyramid in Saqqara and there are theories that Khuwy may have been related to Djedkare, Cairo Scene reported. 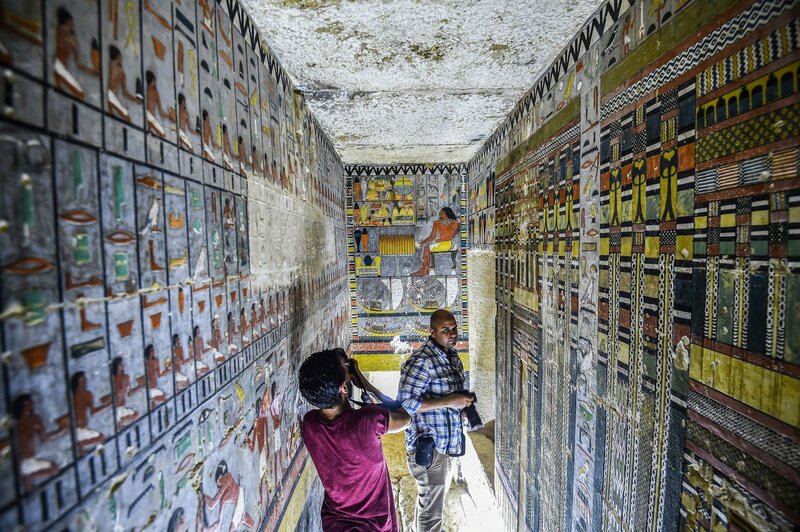 Researchers say that the north wall of the tomb was inspired by the designs of pyramids built during the Fifth Dynasty. “The L-shaped Khuwy tomb starts with a small corridor heading downwards into an antechamber and from there a larger chamber with painted reliefs depicting the tomb owner sitting at an offerings table,” Mohamed Megahed, leader of the excavation team said, as reported by Mail Online. The team has also recently uncovered other tombs and objects from the Fifth Dynasty, including a granite column dedicated to Queen Setibhor who, according to some researchers, was the wife of Djedkare Isesi. The pharaoh—who reigned for nearly 40 years between 2414 and 2375 B.C.—is considered to be one of the most influential rulers of Ancient Egypt, largely as a result of his administrative and religious reforms, according to Egyptologist Ahmed Saleh, Egypt Today reported. In contrast to other Fifth Dynasty pharaohs, who worshipped the god Ra, Djedkare chose to venerate Osiris and gave precedence to him, especially when it came to funerary rituals. The pharaoh was also notable for devolving power to provincial rulers around Egypt, weakening the authority of the centralized administration. Saqqara, where archaeologists made the latest discovery, once served as the necropolis for the Ancient Egyptian capital of Memphis, which is located on the west bank of the Nile, around 15 miles south of Cairo. In other recent news on Ancient Egypt archeaology, Discovery documentary Expedition Unknown: Egypt Live opened the sarcophagus of a 2,500-year-old Ancient Egyptian high priest on live TV. The first-of-its-kind broadcast explored the archaeological site of Al-Ghorifa, 165 miles from Cairo. The team showed viewers the tomb and mummy of the high priest, and a nearby “family tomb” where two other mummies were found.